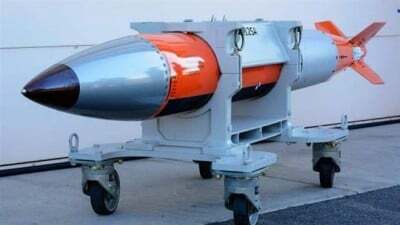 The United States Air Force (USAF) is going to station 20 new B61-12 nuclear bombs in Germany, each 80 times more destructive than the one used on Hiroshima, a report says. The nukes will be deployed to Luftwaffe’s Büchel Air Base in the western state of Rhineland-Palatinate, which is already host to USAF nuclear bombs stored there since 2007 under a nuclear sharing deal, Germany’s ZDF public television network reported on Tuesday. According to the report, in the third quarter of the current year, the base will receive budget for the future storage and deployment of the new atomic weapons, which are considered to be on the borderline between strategic and tactical, as well as funding for upgrading the German Panavia Tornado multipurpose aircraft that are also stationed in the base and are capable of deploying older types of nukes. Back in 2010, however, the German parliament (Bundestag) called on the federal government to take necessary action for the removal of the American nuclear weapons from the territory of Germany, citing public support for such a decision. Moscow has referred to the new move to upgrade Büchel Air Base’s nuclear arsenal as a threat from NATO to Russia’s borders. “The comprehensive analysis of the situation points to the threat posed by the increasing military capability of NATO and its endowment with global functions, which it performs in violation of the international law, as well as the encroachment of the military infrastructure of NATO members on the borders of the Russian Federation,” said Maria Zakharova, the spokesperson for Russia’s Foreign Ministry, in an interview with ZDF on Tuesday. “At the same time in Europe, not just in Germany, but also in Belgium, the Netherlands, Italy, and Turkey, US tactical nuclear armaments remain deployed. The Americans are modernizing their aerial bombs, and the NATO European members are modernizing their aircraft that carry these weapons,” she further noted. According to Zakharova, the move would be in breach of the nuclear Non-Proliferation Treaty (NPT) to prevent the spread of atomic weapons. A total of 191 countries have joined the NPT, which was enforced in 1970.